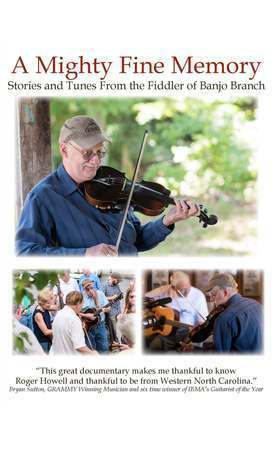 “This great documentary makes me thankful to know Roger Howell and thankful to be from Western North Carolina.”-Bryan Sutton, GRAMMY Winning Musician and six-time winner of the International Bluegrass Music Association’s Guitarist of the Year. Roger Howell is a cultural treasure recognized throughout Western North Carolina for his skill as a musician, his generosity as a teacher, and his prodigious memory as demonstrated by his contribution of 532 fiddle tunes comprising the “Roger Howell Memory Collection of Fiddle Tunes” to Mars Hill University’s Southern Appalachian Archives. Not only this “Memory Collection,” but also all of Mr. Howell’s performances and lessons, are full of stories about the people who taught him this music, the “old people” of his youth. The many ways that Roger Howell has immersed himself in the music of this region since his childhood make his story one worthy of sharing with the wider world. To view movie trailer, click HERE. DVDs can be purchased at the Mars Hill University Bookstore, the Madison County Visitor’s Center, and the Liston B. Ramsey Center for Regional Studies for $20.00 each. The proceeds from the film will go to support the Southern Appalachian Archives at Mars Hill University. This project was made possible by a grant from the Blue Ridge National Heritage Area Partnership.